Sipunculidea (Sipunculidae , Golfingiiformes), Sipunculidae (Sipunculus , Xenosiphon , Siphonosoma , Siphonomecus , Phascolopsis), and Phascolosomatidae (Phascolosoma , Apionsoma , Antillesoma) of Cutler (1994) are most likely not monophyletic (Maxmena et al. 2003, Schulze et al. 2007). Cutler, E. B. 1994. The Sipuncula, their systematics, biology, and evolution. Cornell University Press, Ithaca, NY. Cutler, E. B. and P. E. Gibbs. 1985. A phylogenetic analysis of higher taxa in the phylum Sipuncula. Systematic Zoology 34:162-173. Edmonds, S. J. 2000. Phylum Sipuncula. Pages 375–400 in: Polychaetes & Allies: The Southern Synthesis. Fauna of Australia, vol. 4A, Polychaeta, Myzostomida, Pogonophora, Echiura, Sipuncula. P. L. Beesley, G.J.B. Ross, and C.J. Glasby, eds. CSIRO Publishing, Melbourne. Huang, D. Y., J.-Y. Chen, J. Vannier, and J. I. Saiz Salinas. 2004. Early Cambrian sipunculan worms from southwest China. Proceedings of the Royal Society of London Series B 271(1549):1671-1676. KennetLundin, K. and C.Schander. 2003. Epidermal ciliary ultrastructure of adult and larval sipunculids (Sipunculida). Acta Zoologica 84(2):113-119. Maxmena, A. B., B. F. King, E. B. Cutler and G. Giribet. 2003. Evolutionary relationships within the protostome phylum Sipuncula: a molecular analysis of ribosomal genes and histone H3 sequence data. Molecular Phylogenetics and Evolution 27(3):489-503. Rice, M. E. 1985. Sipuncula: developmental evidence for phylogenetic inference. Pages 274-296 in The Origins and Relationships of Lower Invertebrates. S. C. Morris, J. D. George, R. Gibson and H. M. Platt, eds. Oxford University Press, Oxford. Rice, M. E. 1993. 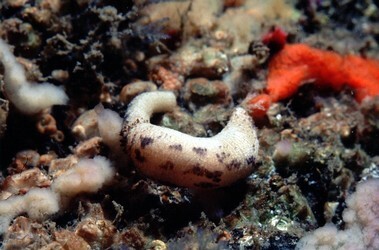 Sipuncula. Pages 238–325 in: Microscopic Anatomy of Invertebrates, Vol. 12: Onychophora, Chilopoda, and Lesser Protostomata. F. W. Harrison and M. E. Rice, eds. Wiley-Liss, New York. Schulze, A., E. B. Cutler and G. Giribet. 2005. Reconstructing the phylogeny of the Sipuncula. Hydrobiologia 535/536:277–296. Schulze, A., E. B. Cutler and G. Giribet. 2007. Phylogeny of sipunculan worms: A combined analysis of four gene regions and morphology. Molecular Phylogenetics and Evolution 42(1):171-192. Edward B. Cutler's home page has links to more information about Sipuncula. Page: Tree of Life Sipuncula. 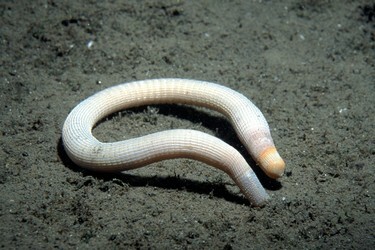 Peanut Worms. The TEXT of this page is licensed under the Creative Commons Attribution-NonCommercial License - Version 3.0. Note that images and other media featured on this page are each governed by their own license, and they may or may not be available for reuse. Click on an image or a media link to access the media data window, which provides the relevant licensing information. For the general terms and conditions of ToL material reuse and redistribution, please see the Tree of Life Copyright Policies.